Habit: Annual 1--50 cm, +- gray, cobwebby to tomentose. Stem: 1, erect, or 2--10+, generally ascending to prostrate, +- forked at least distally, generally evenly leafy proximally, +- leafless between distal forks. Leaf: alternate, +- sessile, linear to obovate or awl-shaped, entire; distal leaves subtending heads, crowded, largest > proximal leaves. 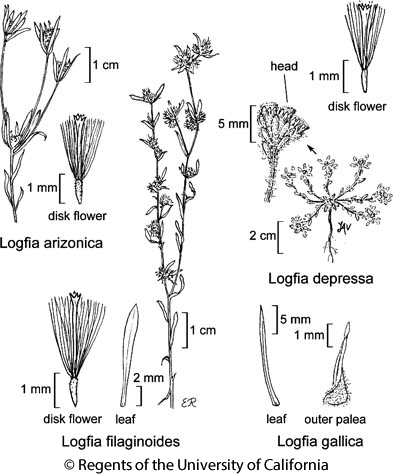 Inflorescence: heads disciform, +- sessile, generally 2--10(14) per group or some [all] single; involucre 0 or vestigial, simulated by paleae, or +- cup-like, then phyllaries various, << paleae; receptacle length [0.4]0.7--1.6 × width, obovoid to mushroom-shaped, glabrous; paleae, except innermost, each +- enclosing pappus-lacking pistillate flower, deciduous with fruit (sometimes tardily), +- boat-shaped, obtuse to acute, +- tomentose abaxially, obscurely parallel-veined, veins 5+, margin reflexed distally as scarious wing, wing prominent, terminal, erect to curved inward, visible in head; innermost paleae +- 5, collectively surrounding pappus-bearing disk + inner pistillate flowers, > outer, spreading at maturity, concave, lance-ovate, acute, cartilaginous, +- brown, +- glabrous. Pistillate Flower: (11)14--45+, generally only outer subtended by paleae; corolla obscure, narrowly cylindric. Disk Flower: bisexual, 2--10; pappus present; corolla 4--5-lobed; anther base tailed, tip +- triangular; style tips +- linear-oblong. Fruit: obovoid to oblong; outer pistillate-flower fruit > inner, +- enclosed by palea, generally compressed laterally, smooth, shiny, corolla scar +- terminal, pappus 0; inner pistillate-flower fruit and disk fruit free of paleae, +- cylindric, generally +- papillate, dull, corolla scar terminal, pappus of (11)13--28+ deciduous bristles, visible in head, generally falling together in intact or broken ring. Species In Genus: 12 species: southwestern North America, Europe, southwestern Asia, northern Africa, some alien +- worldwide. Etymology: (Anagram of Filago) Note: Characters may be unreliable in young or dwarf pls. Formerly included in Filago in North America. Unabridged Note: 2 Europe aliens, Logfia arvensis_(L.) Holub, Logfia minima (Sm.) Dumort. occur near California. Habit: Plants 1--5(10) cm. Stem: (1)3--10+, forked +- throughout, +- gray to +- white, generally tomentose. Leaf: elliptic to obovate, flexible, largest 6--8(10) mm, 1--2 mm wide; distal leaves generally 0.8--1.5 × heads, obtuse. Inflorescence: heads 2--5 per group, some between stem forks and tips, +- pear-shaped, largest 3--4 mm, 2--2.5 mm wide; phyllaries 0, or 1--4, unequal, like vestigial paleae; outer paleae in spiral ranks, curved inward 20--60°, longest 2.1--3.1 mm, body, except midvein, membranous. Pistillate Flower: outer 7--13; inner (with pappus) (4)10--21. Disk Flower: 2--5; corolla 1.3--2 mm, lobes generally 5, +- yellow to +- brown. Fruit: outer 0.7--0.9 mm, +- straight; inner generally smooth, pappus bristles (11)13--15, 1.3--2.4 mm, falling separately or in 2s. Ecology: Dry, open, generally sandy flats, slopes, drainages; Elevation: < 1500 m. Bioregional Distribution: s SNF, SnJV/SCoRO/WTR, SCo, PR, s SNE, D; Distribution Outside California: to southern Nevada, southeastern Arizona, northwestern Mexico. Flowering Time: Feb--May Note: See Logfia filaginoides. Common only outside CA-FP. Citation for this treatment: James D. Morefield 2012, Logfia depressa, in Jepson Flora Project (eds.) Jepson eFlora, http://ucjeps.berkeley.edu/eflora/eflora_display.php?tid=85270, accessed on April 25, 2019.
s SNF, SnJV/SCoRO/WTR, SCo, PR, s SNE, D; Markers link to CCH specimen records. Yellow markers indicate records that may provide evidence for eFlora range revision or may have georeferencing or identification issues. Purple markers indicate specimens collected from a garden, greenhouse, or other non-wild location.